This was the day our local football team, FC Basel, played against Chelsea. The streets downtown were crowded with fans of both teams. The atmosphere was great and everybody seemed to have a good time. I was reluctant to take out my sketchbook, because the heavy police presence suggested that things could turn less peaceful at any time and I didn't want to get caught in the middle, holding my fineliner as only mean of protection. In the end I found what I thought it was a safe place, next to four police vans, but as the hour of the match approached, everybody started to leave towards the stadium and I stood pretty much alone. I sketched for a while and arrived home in time to watch the second half of the match. Basel 1 - Chelsea 2. Ahh the life of a warrior sketcher! Nice drawing. Great perspective on the bike. Thanks Maria. 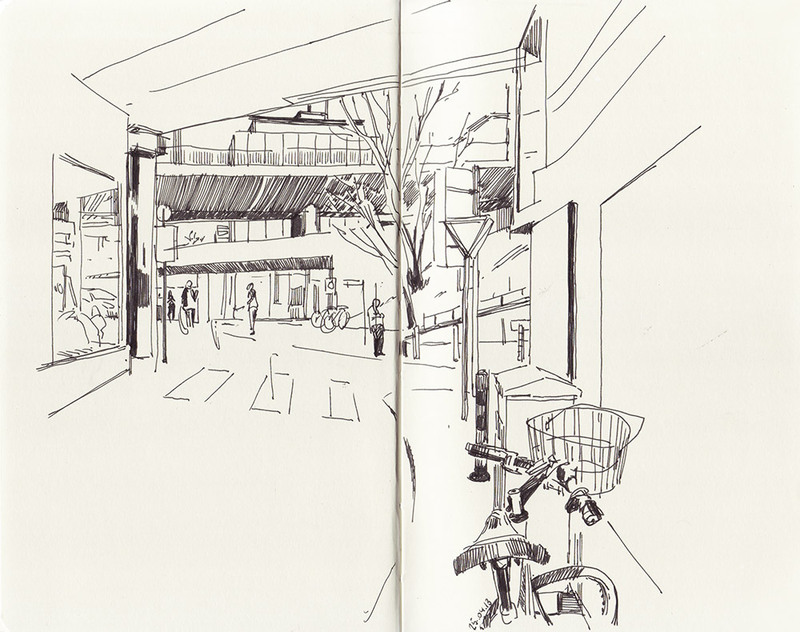 Nothing like urban sketching for an adrenaline rush.